Had some time and just thought that I would take a look the the Crush the Commonwealth chatter from 2015 and low and behold next years start date has already been posted. It’s a long ways off but 2016 CTC is Friday Apr 29th. Mark your calendars! I copied the text from the site…..see below. Starting in 2016, Crush the Commonwealth will always start at 5:00 am on the last Friday of April, from now until no one shows up. Even years start in Philadelphia at the Liberty Bell. Odd years start in Pittsburgh at the fountain in Point State Park. Wow. With a date that late in the month, there will probably be nice weather. I would have gone for the week earlier if I was the organizer, but I am not. I think I am done. Four years is enough. Say it’s not so Stef! Well, lots of time to think about it. I’m glad to know a date as I have to choose vacation days in a month or so. I was a dnf last year and really want to give it another go. I’m concentrating on Diirty Dozen training for the next couple of months and then will give it some more thought. Comments are now working on the blog, for those that are into that type of thing. An email was sent out some time ago that the event will always fall on the last Friday in April. I DNF’ed 2 years ago coming from Philly outside of Bedford. There’s a good chance I’ll try to redeem myself. It’s all good man. I was in Philly a couple of weeks ago for work and rode the first 20 miles or so out towards Valley Forge and of course then back to my hotel. Did that four of the evenings I was there, so I consider myself proficient in getting out of town on the Schuylkill trail. One less thing to worry about….. It seems most people (me included) had difficulty the first few miles off the trail. People get turned around a good bit from the trail to Rt 23 towards Morgantown. I took a good look at the maps and it appears that on my out and backs I turned around about 2 miles short of getting off the trail. I’m headed back in March for a week and will extend my round trip and take a look. Thanks for the tip. I am thinking of submitting this route as a permanent. That is, a ride that you could get credit for completing, from Randonneurs USA, by getting a controle card signed at certain set locations. You would have to contact me, as the permanent owner, to get the controle card before doing the brevet. This wouldn’t affect the race at all, except that you could ride the race and get RUSA credit for it at the same time, if you carried a controle card and got it signed. You’d have to complete the ride in about 41 hours. 1) Does anybody object to this? Am I stepping on anybody’s toes? 2) How fixed is the Crush the Commonwealth race route? In the past people have, obviously, not used the Pinkerton Tunnel, but now they can. Are they allowed to, even though that makes the route a bit shorter? How about using the changes to the Schuylkill River trail that make it possible to stay on the trail and not have to detour onto roads a couple times? Oh, BTW, you could do the permanent any time, not just at the time of the race. You’d just have to contact me in advance to get a controle card. Does anybody know how to get in touch with the Crush the Commonwealth organizer? There’s no email address on the site. I want to make sure I’m not overstepping. I am inclined to say leave it as an unofficial underground thing. If someone wants to ride it whenever, they can, but having it as anything other than what it currently is makes it something other than what it currently is. If you are going to do a perm, consider making a route actually worth riding. Here was my thoughts on the matter along with a route that has been partially developed, but not fully scouted between Burnt Cabins and Exton (yet). It’s all the honor system, so you could, of course, get away with it, but…..
I’d like to keep the same route, but out of deference to Stefb’s preference, call it something else — P2P or something like that. That way it can be it’s own thing, and people already ride Crush the Commonwealth for different purposes; training and whatever. I think it’s a good enough route. It’s cool riding all the way from Pittsburgh to Philadelphia, or vice versa. I don’t see a conflict with riders getting “credit” for another event because they’re not really getting credit for Crush the Commonwealth. The better the route, the more likely it is to actually be ridden by someone else as a perm. I sometimes have to wonder what the PA Bike Routemiesters were thinking in choosing certain parts of the various routes. That said, it seems to me that most perms are developed and submitted so they can be ridden by the person who submitted them (so they can rack up RUSA credits conveniently). Wondering about how attractive they will be to someone else is usually a non-issue. I am moving the first week of April +/- so I wasn’t sure if I could do this, but then I found out today it isn’t until the end of April now. Anyone interested in splitting a rental car to Philly? My girlfriend offered to drive me, but a rental car is pretty cheap one-way on priceline.com and it will be even cheaper splitting it with another rider. Was $80 to get one from Philly to Pittsburgh last year. Without a bike rack, it can only hold 2 people, but $40 and gas is cheaper and much more convenient than a Greyhound or another option like that. Seems you should be able to buy or borrow one of those strap-on racks for a rental. I have one more or less permanently hooked to my car, and a couple years ago drove to Philly and back on the Turnpike with three bikes hooked to it. Yeah I have one, but I don’t feel like trying to send it back home etc when I get to philly is all. I’ve got one that holds 3 bikes but I’ve carried 4 on it before LOL. Is anyone actually doing it this year? I’ll be there with a buddy.. Bikepacking this year and taking it slow..
Can anyone describe how to get from GAP to Point State Park these days? I got lost a few years ago and I hear the path is “complete to the park” now. Is that true? There are other ways going down ft Duquesne but to me this is the easiest. Be careful- that Saturday and Sunday lots of stuff is closed off downtown for the 5k and kids run (Saturday) and half and full marathon (Sunday). Especially Blvd of the Allies and a lot of point state park. My advice would be to stay on the trail on the south side and NOT take the hot metal bridge to the jail trail to the point. Stay on south side trail. Watch how it jogs around into the street near the terminal buildings and rejoins the trail. That is fairly well marked I think. It then goes past highmark soccer stadium, loops around on the sidewalk to the left and toward the fort Pitt pedestrian bridge. It gets narrow past the staircase to the incline, and again on the actual pedestrian bridge. It drops you into point state park where the fountain is. It avoids any part of that steel valley bike ride that may be on the jail trail (I don’t know details, I just saw signs), any paving on the jail trail, the confusion from getting off of the jail trail and to the point, and any activities downtown related to the marathon. I know you’re supposed to stay on the course, but the way I mentioned runs parallel to the course (just on the other side of the river), and is likely safer and the same distance. Not sure if anyway would crucify you for going that way. It would be my choice. That’s a great idea. Better than mine! I never knew there was a bridge there. And you won’t have to deal with traffic or Marathon or anything. That actually may be slightly longer since it is on the outside of the curve of the river instead of the inside, but is anyone going to notice at that point? Thanks for the link, Marko. 5k starts at 8 am Saturday followed by the kids run. Prob all the streets should be olen by 1 p ish? Sunday Marathon starts at 7. All streets open again by 2-3? Organizers give 7+ hours to finish full merathon. So how course is closed depends on the distance, e.g. mile 2 water station (the one I usually volunteer for) starts closing around 6:00 am and reopens at 10:00 (everything is cleaned and removed). Mile 23 station (accross mile 2 station and on Liberty) only got prep starting at 9:00 and it’s open well pass noon. Point park is “under control” usually all the way to 3:00pm, may be longer. Unfortunately for me, the weather looks great, and there are going to be tailwinds from the east on Saturday. What are the chances of that happening? Wish I could do it this year, but I have family in town for the marathon. I would have loved to crush it this year. I am pretty certain that without horrible headwinds (and in fact, tailwinds) and precip, this could be done in 30-32 hours. safe travels to those who are doing it. Enjoy. I’m in the process of getting the route approved as a permanente. So if you wanted to do it later in the year, you could, and get RUSA credit for it. Though it would be tough to give up on the excitement of the spring weather. So, I’m in Philly for work so wondered down to the CTC start line to see everyone off. I counted 21 riders. Didn’t get a count of how many ladies but heard a few female voices, so at least a few. I had them off at 5:05. Nice. Hard to tell from the video. It looked like 14, then I went back and tried to recount and got 19-20. There is a woman named Suz doing it. Tom Oswald and Gavin B are doing it. They have both done the race before and are strong riders. Gavin is a randonneur from the other side of the state, and Tom owns a bike shop from what I gather. I am not sure about the other riders, but I pick one of those two to win. I was sad about having to sit this one out, but also relieved. And currently cuddling with my dog in a warm bed. Part of me hopes that they hit rain and miserable weather. It is tradition. I may be off a rider or two. I got there right at 5 and they didn’t waste much time in getting off. I chatted a bit with a spouse of a Pgh dude and heard someone say “let’s go, does anyone know the way” and a lady shouted out ” I do” and they took off. 45 degrees and cloudy at start time. Enjoy your weekend with your family Stef! 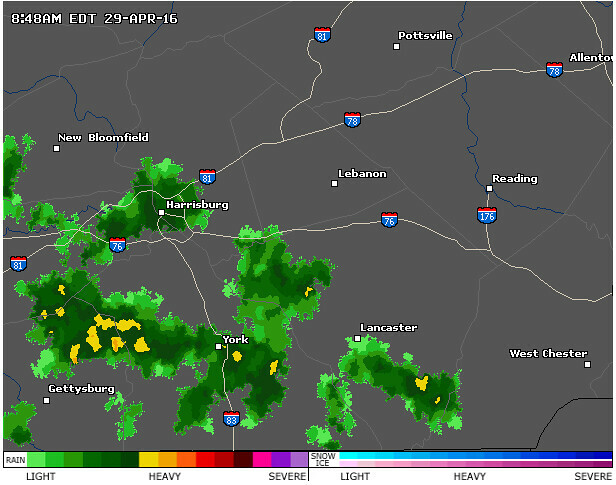 Looks like rain near Lancaster, York, etc.